Articles copyright 1995-2016 Workers World. Verbatim copying and distribution of this entire article is permitted in any medium without royalty provided this notice is preserved. Wisconsin State Rep. Mandela Barnes says the police killing of Sylville K. Smith took place in a city where African Americans face enormous inequity, high unemployment, mass incarceration, and a failing education system. 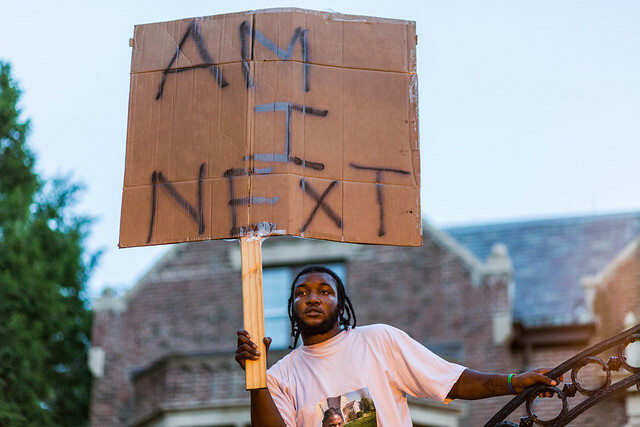 The violence and unrest affecting Milwaukee, Wisconsin has been years in the making and was not just triggered by the latest police-involved shooting of an African-American man. The mid-western city has been plagued by social, economic and political problems over the years. Milwaukee has the second highest black poverty rate in the country and the state of Wisconsin owns one of the highest incarceration rates for African-Americans among the states. RT America’s Manuel Rapalo has the report. Black Agenda Report’s Glen Ford: Mass incarceration begins with hyper-surveillance of the Black community and ends in death as it did in Milwaukee. This entry was posted in All Posts News Politics and-or Videos, Civil Rights, Dandelion Salad Videos, Police, Police Brutality, Politics, Poverty, Protests, Racism and tagged Collapse, Glen Ford, Inequality, Milwaukee, Wisconsin. Bookmark the permalink.